SIUE Students Today, Alumni Tomorrow (STAT), the student organization of the SIUE Alumni Association and Foundation, is dedicated to enhancing the connection between students of the past, present and future while strengthening lifelong loyalty to SIUE. 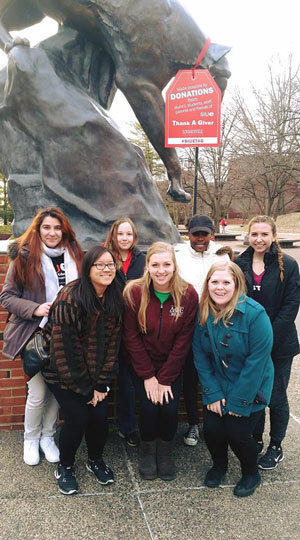 Throughout the entire month of February, SIUE STAT members joined hundreds of educational institutions in celebrating Student Engagement and Philanthropy Month. The global initiative, organized by the Council of Advancement and Support of Education, is designed to increase student understanding of philanthropy and grow engagement on college campuses. Members of STAT created a dynamic social media campaign where students have an opportunity to win prizes, while encouraging them to thank those who make the University better through philanthropy. When a student comes upon a specially-marked “Thank-A-Giver” tag, they are invited to take a selfie with the tag and post it to the SIUE STAT Facebook page with the hashtag #SIUETAG for a chance to win a $100 Visa gift card. “We wanted to highlight the tangible impact our donors have on campus by highlighting them with Thank-A-Giver tags,” said Taylor. “Tanks for Thanks” day gave students the opportunity to earn a free tank top for creating thank you cards that will be sent to donors. STAT has had an information table set up in the MUC throughout the month of February to raise awareness about the importance of private giving. Throughout the year, STAT members create a culture of philanthropy on campus by encouraging students to participate in programs that inspire a positive volunteering and giving culture.